More than 125 young people recovering from cancer have completed a round-Britain sailing challenge run by yachtswoman Dame Ellen MacArthur. The Ellen MacArthur Cancer Trust project began in May and saw young people aged 10 to 30 visit 58 towns and cities in the UK, over 17 relay legs. Ryan Campbell, who took part, has undergone treatment for osteosarcoma - a rare type of bone cancer. He said: "It's about surpassing what you think you can't do." Mr Campbell, 22, from Gourock, Inverclyde, was on board the 44ft yacht for the final leg of the journey which ended on Saturday. "It's such an amazing cause and there's nothing else like it out there," he said. "It's not focused on being ill."
Another of those who took part, Hannah Spencer, said she "wouldn't be here" without the trust. Image caption Ryan Campbell, who took part in the voyage, described it as "an amazing cause"
The 23-year-old, from Belper, Derbyshire, was diagnosed with chronic myeloid leukaemia in 2009 and worked as a volunteer mate on the voyage. Dame Ellen, the charity's founding patron, said the project was about "rebuilding the confidence, self-belief and independence of those involved". She said: "It's been fantastic following all the adventures of the young people during Round Britain 2017." 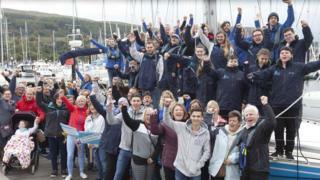 Olympic sailor Luke Patience was among those who welcomed the crew back to Largs, from where the voyage began in May. He described it as "an extremely humbling experience". The sailing journey took place in areas including Cowes, Cardiff, Glasgow, Belfast, Plymouth, Bristol, Liverpool, Edinburgh, Newcastle, Hull, London and Southampton. The crew also visited cancer treatment centres where they meet other young people who are still in recovery. In 2005 Dame Ellen, who is based in Cowes on the Isle of Wight, broke the world record for the fastest solo circumnavigation of the globe. The current record holder is French yachtsman Thomas Coville.